I have developed the following method of looking at the “stages of change” Tschoop’s/John’s life experiences have led to. It is interesting to review the kind of impact someone can have on people, even during his/her afterlife. These experiences are a result of the people as well as a result of the person to whom they relate, in the physical life and afterlife. The stages are briefly discussed, then some examples of the documents supporting my claims for each stage. These stages are reviewed in additional detail on subsequent pages, one page per stage. 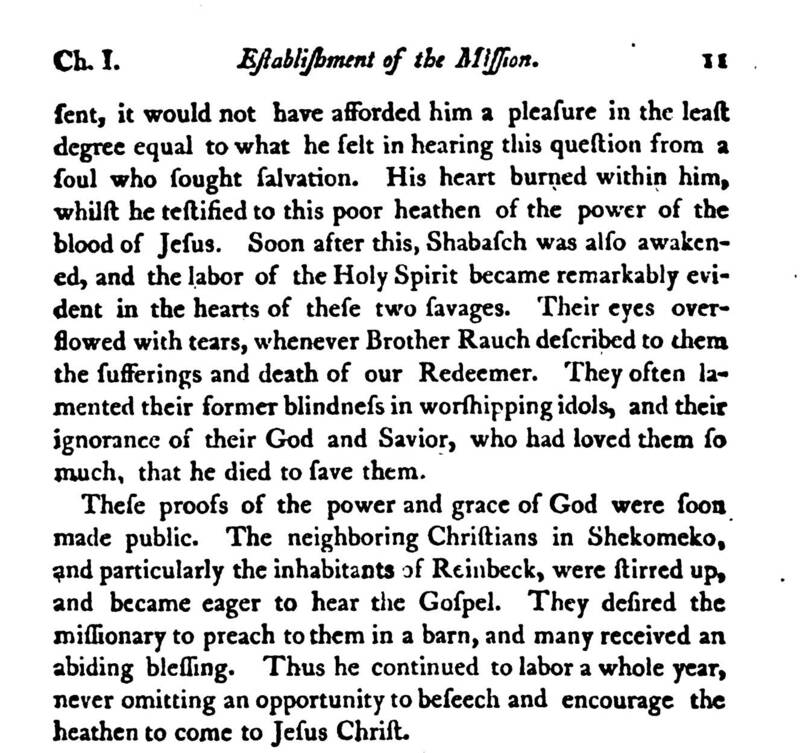 Stage I. Realization, acceptance and conversion: the period when Rauch meets up with Tschoop and Shabasch, he manages to make his way back to their settlement, attempts to convert them, with and without success, and finally succeeds in convincing his first follower(s). Stage II. Propagating the Word: these initial followers now set the stage to help others to make their own decisions. Other witness this new state the converts are in. They witness their baptism. They see the changes these events had on the individual’s persona. This causes them to question which of their own possible paths is the best one to follow. Each of these who become converts have their own personal experiences and reasonings which they based much of this decision making process upon. Stage III. Social change then begins to take place within the local and neighboring community settings as individual s, not normally interacting with the first community undergoing change, also become witness to the changes. They also undergo much of the same conflicts in life that the first group went through, and with enough matching cultural similarities, see and react to the need for change. This change that happens has to again fit a series of personal and social needs for this new organization in order to have a positive and long term impact, demonstrating success. Stage IV. The development of Global concepts and Universal Change: as this tendency for group change continues to spread, it can begin to incorporate groups that previously were not at all directly linked to the originating source for these changes. These changes usually take multiple paths, with parts of them becoming incorporated into other social movement events, for example, the practice of outdoor prayers sessions by one spiritual movement in turn are added to the practice of another. In this way, the changes that are propagated spread from one place to the next, and ultimately become very widespread. This is the requirement for the establishment of universal or global changes in attitudes and behaviors. At first, these changes are popular across a large area of a continent or major land mass with ongoing communications linking one area to the next. But with time, as this “Word” continues to spread, it finally reaches some sort of global or universal state, becoming widely dispersed knowledge with a very solid foundation of history and philosophy that can continue to be promulgated. At this point, only the long term impacts of social values and political events can drastically modify what has become a revelation followed by a major social movement. Each of these stages represent the series of changes an individual and social group must go through in order to produce that can be felt for generations to follow. When relating these four stages to the sanctification of people and their beliefs, it becomes immediately obvious what types of events are occurring that are due to the individuals related to this socially induced process of change. Even the Pop himself had a period of uncertainty in life, during which time he had to endure his personal tests as these relate to Stage I. Once he had committed to a particular avenue for change and future life practices, he now must maintain and demonstrate that commitment by engaging in whatever activities needed to become such an important influence. Spiritual guidance during this time is mostly personal and internally generated, with some support provided by social structure. Once this individual (the Pope in this case) has reached that level of certainty, and his following consists of more than just a few flocks of local sheep so to speak, he begins to play a role in a much bigger picture in society, and others of his kind see the importance of his messages and way of being. This would be very much like when this individual may soon become someone considered very special globally and internationally, but mostly at the leadership level, not at the social level except for locally. The development of a Stage IV individual takes place when he or she becomes a national and international influence. This influence is demonstrated, as personal and social experiences, resulting in documentation of the meaning and reasoning for this individual’s methods of personal guidance and formal leadership. As evidence for this stage in development, the global knowledge about this person and his or her social cause become an important part of many people’s lives, globally. As a result of these we see the development of such practices as engagement in internationally recognized holy days related to that person and/or that person’s cause, and we see migrations of people in large numbers occur in order to travel to and show personal respect for this person’s influences upon the world as a whole. The canonization process pretty much follows the research of proof for impact generated, as they relate to these above four stages of spiritual and godly development. The proofs I can submit are therefore presented in this order. In a way, out own processes that we must engage in when trying to understand someone else’s life experiences, in order to determine if in our own mind that person deserves our personal attention, enough to become our own personal ‘guru’ so to speak, requires that we go this these steps on our own as well in trying to understand the other individual’s persona, purpose and cause. What made me realize this was possible for this individual to be reviewed and analyzed so meticulously? What gave me that spark to discovering the possibility that this person deserves recognition aside from my own? Were these events the consequences of my own personality and needs, certain spiritual events that took place in my life (or that of an acquaintance, relative or close friend), or were they just due to mere coincidence? Proofs needed for Stage I. Proofs needed for Stage II. Proofs needed for Stage III. Proofs needed for Stage IV. 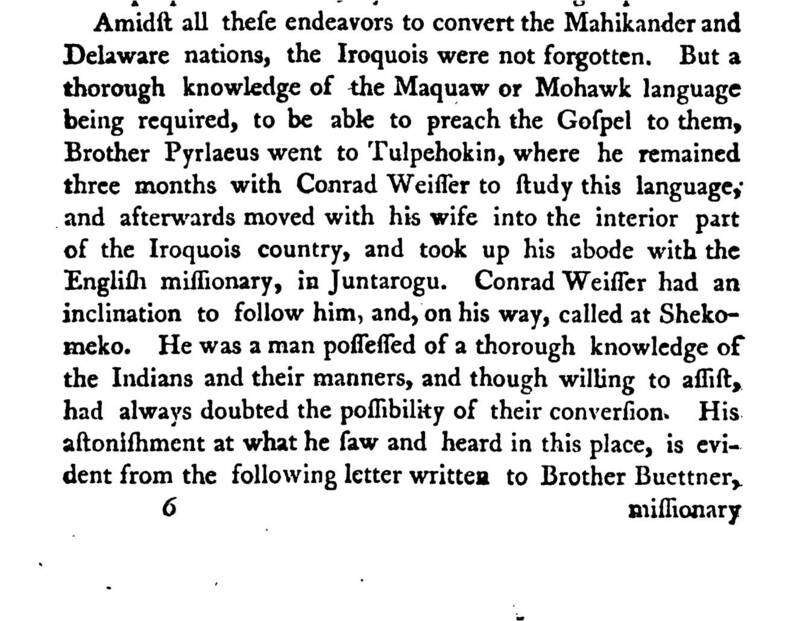 “Two North American Indian Christian Converts”. Sunday Reading, Adapted for Families; for the use of City Missionaries—Sunday School—Tract Distributors—Colporteurs—and Every Agency Employed for the Diffusion of Sound Gospel Truth. pp. 45-6. Sat Aug 10, 1861. “But now I am happy, for I know that our Saviour has done much for me. I am now as much bumbled as I was sorrowful. 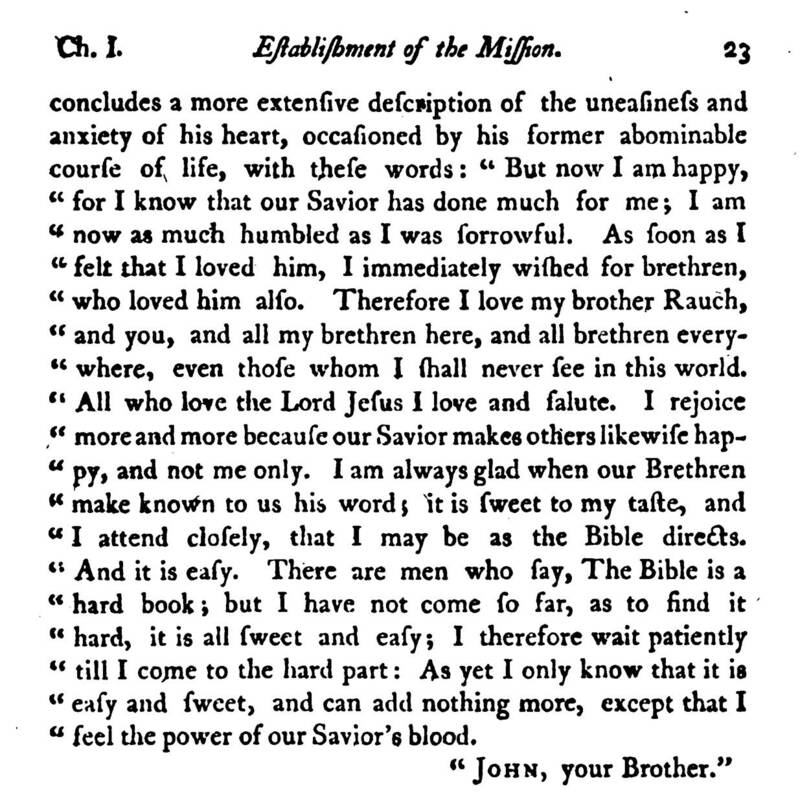 As soon as I felt that I loved Jesus, I immediately wished for brethren who loved Him also; therefore I love my brother Rauch, and you, and all my brethren here, and all brethren everywhere, even those whom I shall never see in this world. ” My dear brethren and sisters,—I love you much. The sensations of my heart I cannot describe. I feel that I love my Saviour, but I see that much is still wanting. ” Formerly I did not know what it was to be a truly humble sinner, but now I find that the poorer in spirit I am, the more happiness I enjoy. I perceive plainly that there is no true pleasure but in communion with our Saviour, nor will I have any but in Him. I cannot be humble enough, when I consider what He has done for me ; for I was a very bad man, cold as a piece of ice, and dead as a stone. His blood has softened and warmed me. 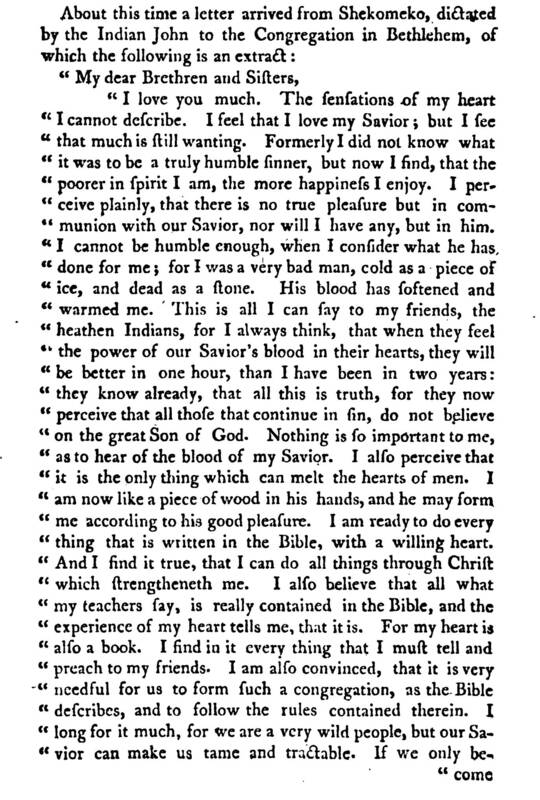 ” This is all I can say to my friends, the heathen Indians, for I always think that when they feel the power of our Saviour’s blood in their hearts, they will be better in one hour than I have been in two years. They know already that this is truth, for they now perceive that all those that continue in sin, do not believe on the great Son of God. I also perceive that it is the only thing that can melt the hearts of men. I am now like a piece of wood in His hands, and He may form me according to His good pleasure. I am ready to do everything that is written in the Bible, with a willing heart; and I find it true that I can do all things through Christ, which strengtheneth me. I also believe that all what my teachers say is really contained in the Bible, and the experience of my heart tells me that it is; for my heart is also a book; I find in it everything that I must tell and preach to my friends. I am also convinced that it is very needful for us to form such a congregation as the Bible describes, and to follow the rules contained therein. I long for it much, for we are a very wild people, but our Saviour can make us tame and tractable. If we only become His good and willing children, then everything will be easy; and may He grant us this grace for His blood’s sake. “One day a gentleman, passing through Shekomeko, called on the Count, and entered into a dispute with him concerning the person of the Son of God. 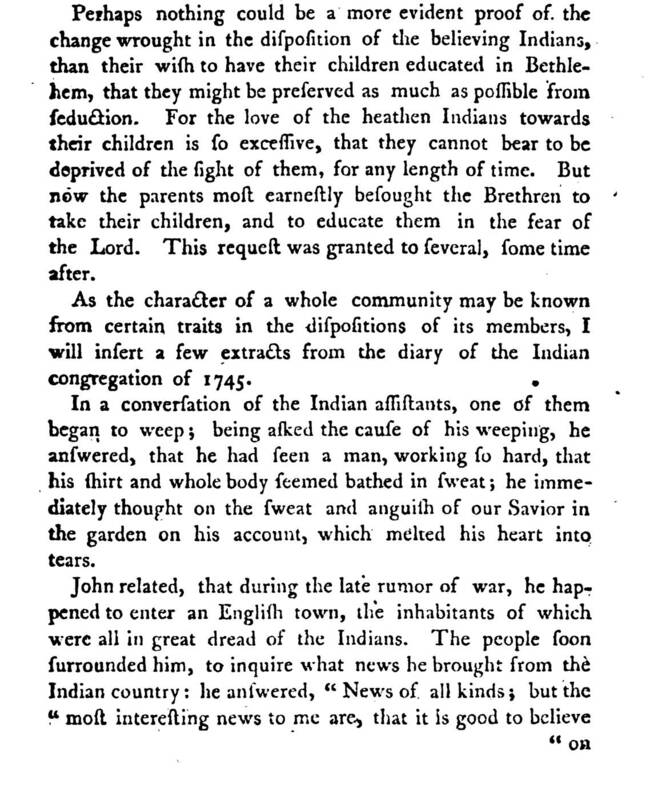 The Indian, John, who was lying on the floor, ill, began to pray that Jesus Christ would reveal Himself to the gentleman, and when he was gone, John exclaimed, ” Oh, how will this man be ashamed, when he learns to know the Lord Jesus.” During the Count’s visit to this place, six more individuals were baptized, and thus the first congregation of believing Indians, established by the brethren in North America, consisted of ten persons. 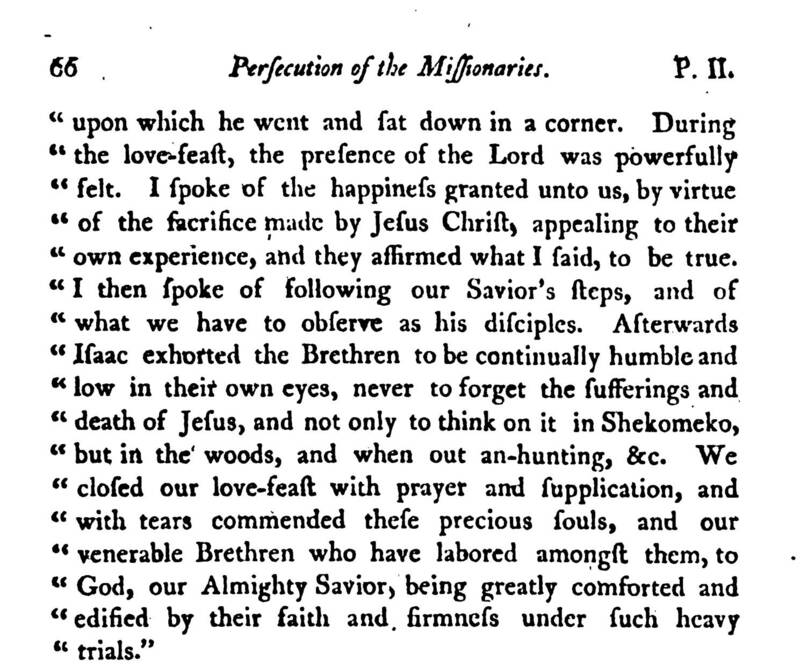 Their sincerity, faith, and love afforded inexpressible joy to the brethren; and they were treated with esteem, in a remarkable manner, even by the wildest savages. 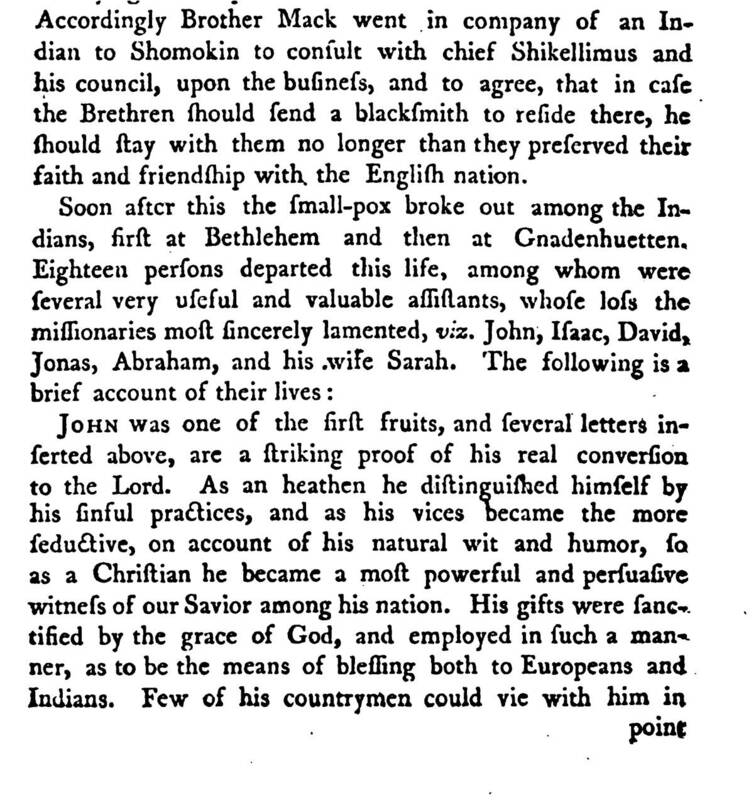 1818, John Holmes. 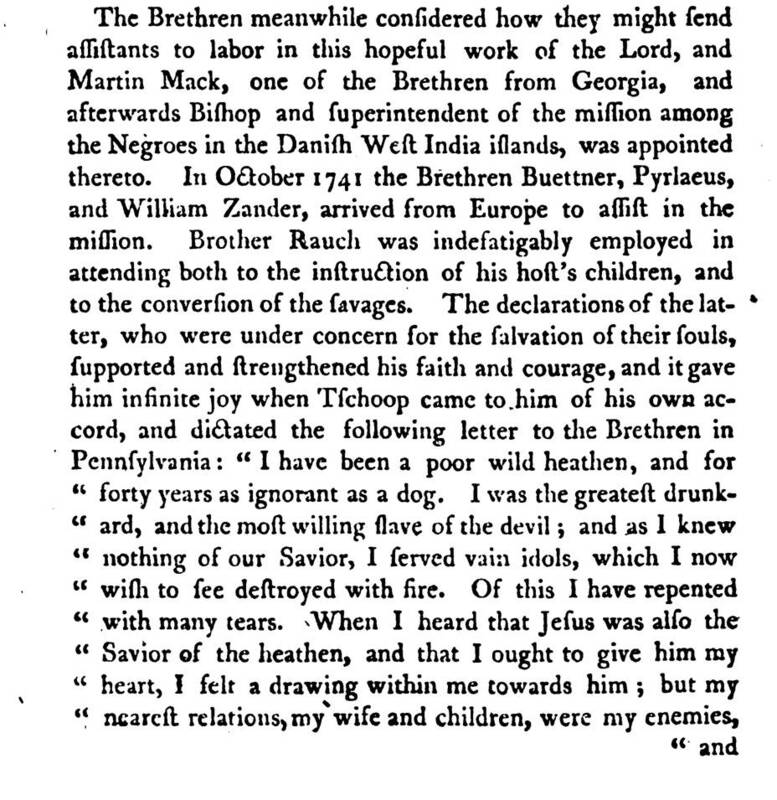 Historical sketches of the missions of the United Brethren: for propagating the Gospel among the Heathen, from their Commencement to the Present Time. (Dublin, 1818) pp 126-129. “By degrees, his meek and humble behaviour, his perseverance and courage gained the admiration of the Indians, and changed their conduct towards him. He went frequently among them, ate and drank with them, and. even lay down to sleep in their huts with the greatest composure. This latter circumstance, in particular, excited their astonishment. This is also documented in William Brown. The History of the Propagation of Christianity among the Heathen sicne the Reformation. 2ed. Edinburgh, 1823. Vol. 1, Section III, North America. 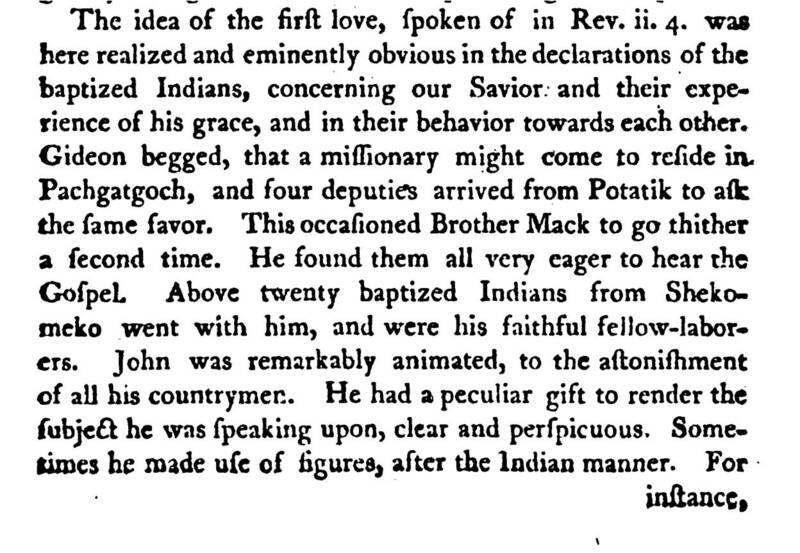 “Having thus regained the confidence of the Indians, brother Rauch was unremitting in his labour for their good, and had the joy to observe, that many were powerfully impressed when discoursing to them of the love of Jesus to sinners. 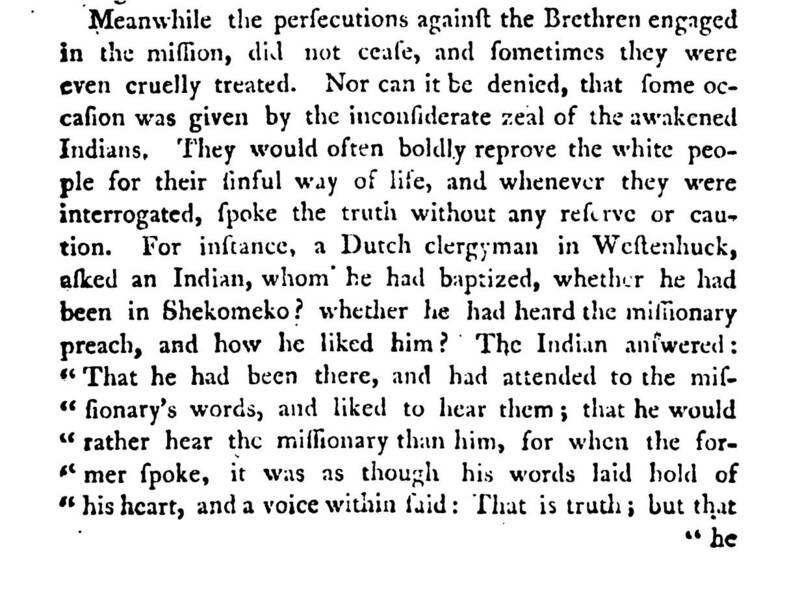 But, in no instance did the word reach the conscience with greater power, or more strikingly display its saving efficacy, than in the case of Tschoop, before his conversion he was distinguished by every act of outrage and sin, and had even crippled himself by his debaucheries; but now the lion was tamed, and the slave of sin and the devil became a child of God and a preacher of righteousness to his countrymen. “The account he once gave of his conversion, will best elucidate the striking change wrought in him. “Brethren,” said he, “I have been a heathen, and have grown old amongst them; therefore I know how heathen think. Once a preacher came and began to explain to us, that there was a God. We answered, ‘ Dost thou think us so ignorant as not to know that? Return to the place from whence thou earnest.’ Then again another preacher came and said : ‘ You must not steal, nor lie, nor get drunk, &c.’ We answered: ‘Thou fool, dost thou think us ignorant of this ? Learn first thyself, and then teach the people, to whom thou belongest, to leave off these things. For who steal, lie, or are more drunken than thine own people?’ And thus we dismissed him. After some time brother Rauch came into my hut, sat down and spoke nearly as follows : ‘ I am come to you in the name of the Lord of heaven and of earth: He sends to let you know, that he will make you happy, and deliver you from the misery, in which you lie at present. 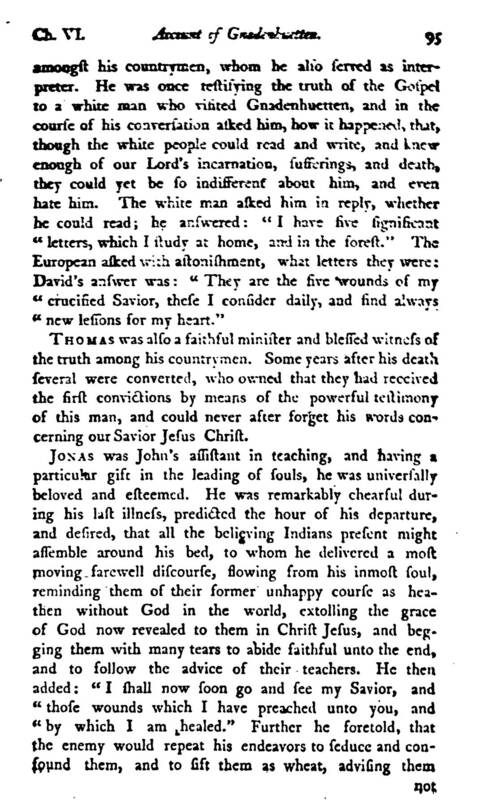 For this end, he became a man, gave his life a ransom and shed his blood for sinners, &c.
Excerpt from History of the Mission of the United Brethren among the Indians in North America, by George Henry Loskiel, Part II. 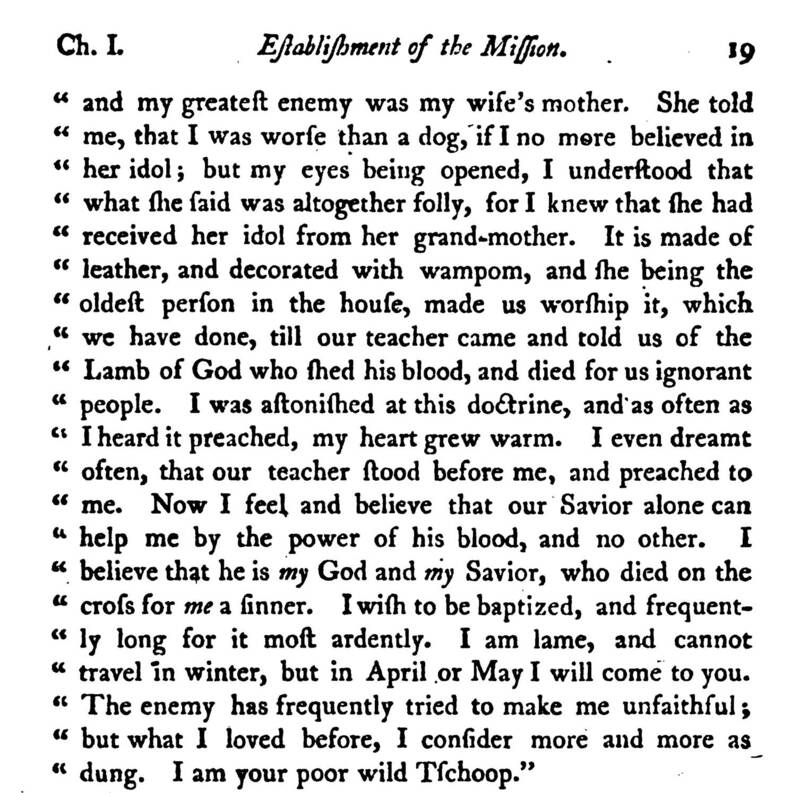 p. 7. In Miron Winslow. 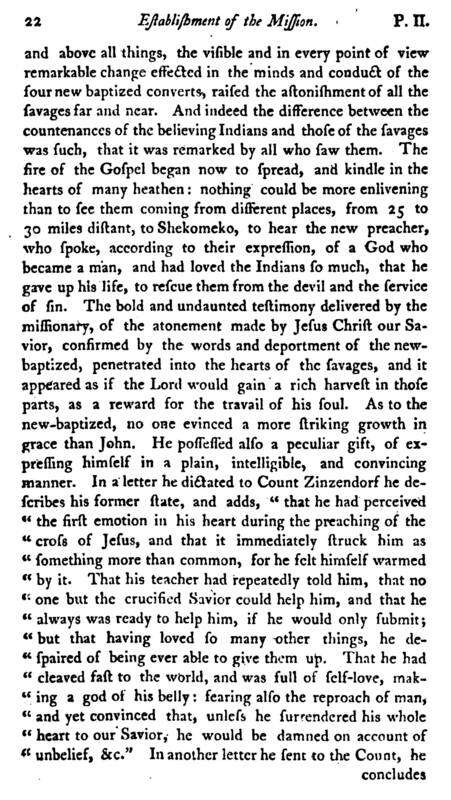 A sketch of missions: or, history of the principal attempts to propagate Christianity among the Heathen. Chap. 8, “North America”, 192-216. 1819. 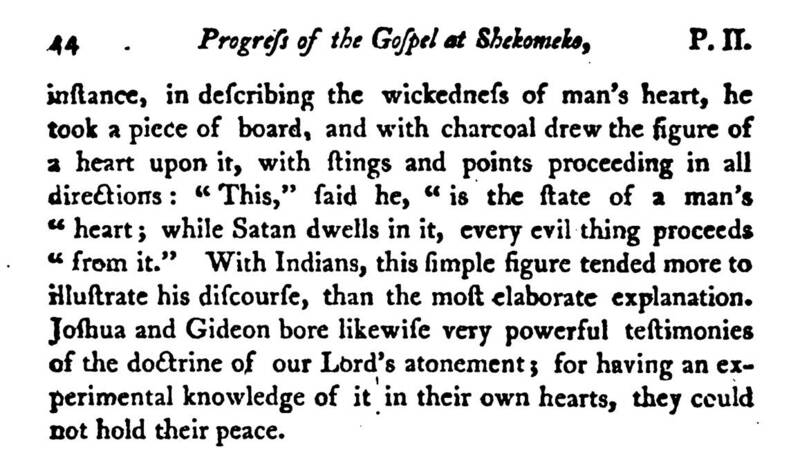 In a book review of The History of the Propagation of Christianity among the Heathen since the Reformation. By the Rev. William Brown, M. D.— Second Edition. 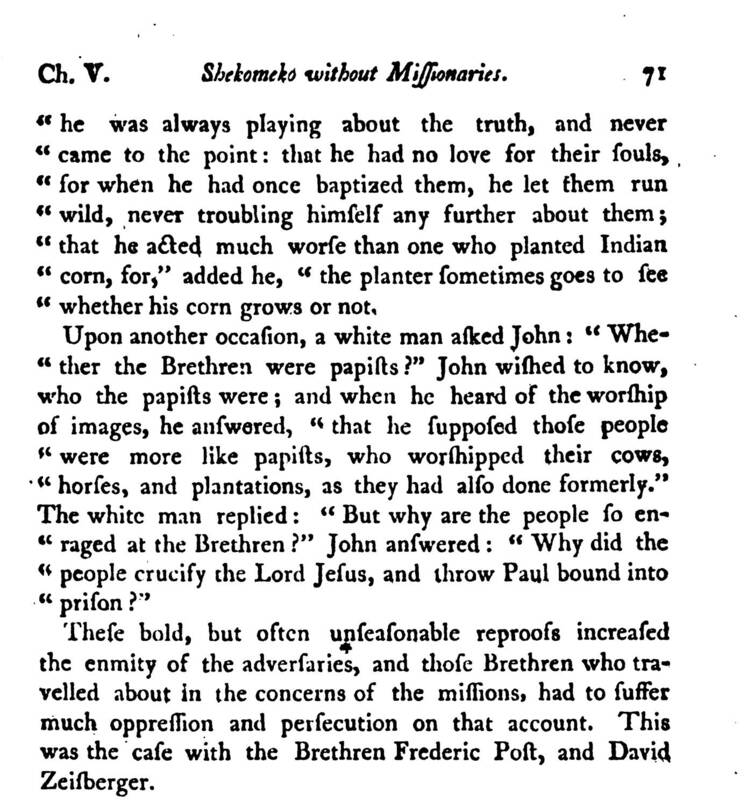 2 Vols., published in The Christian guardian and Church of England magazine (Oct. 24, 1824, p. 388), Brown’s theme is reiterated on P.388. Mission life; or Home and foreign church work. 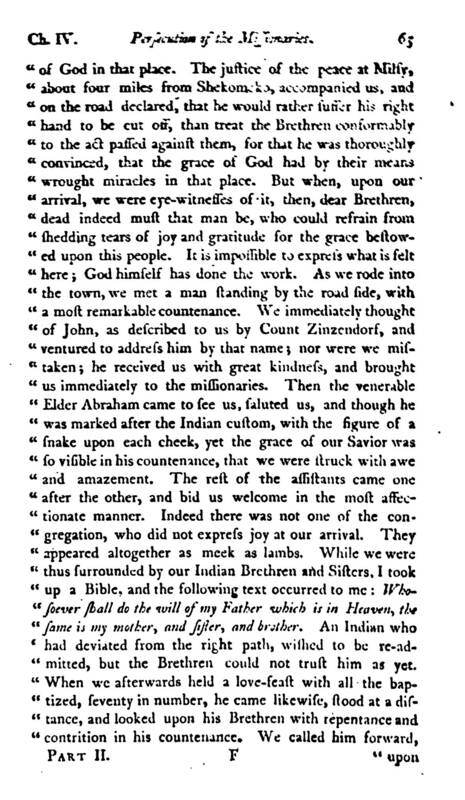 Oct 1870, “THE MORAVIAN MISSIONS.” By the Author of Moravian Life in the Black Forest. 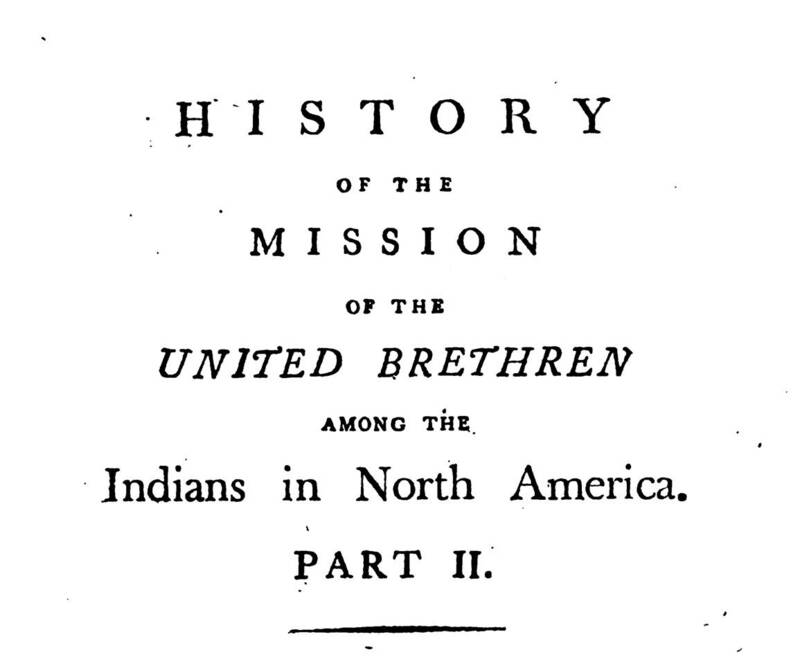 “CHAPTER V.—MISSIONS TO THE NORTH AMERICAN INDIANS.” pp. 596-606. One day, as the missionary lay asleep in Tschoop’s tent, the savage thought thus within himself—” This cannot be a bad man; he is not afraid. He puts his life in the hands of a drunken mad Indian, and lies down to sleep in my hut. I could kill him, and throw him into the wood, and nobody know or care what become of him. But he is not afraid. He cannot be a bad man.” He thus read the living epistle, and it unbarred his mind, and opened his heart to the truth. He soon renounced his pride ana lus drunkenness, and fled to the blood of Christ for salvation. Demonstration of a global impact. The response of tourists to the story of the Moravians, including the importance of Tschoop’s experience and life story. “The first two converts were Shabash and Tschoop. 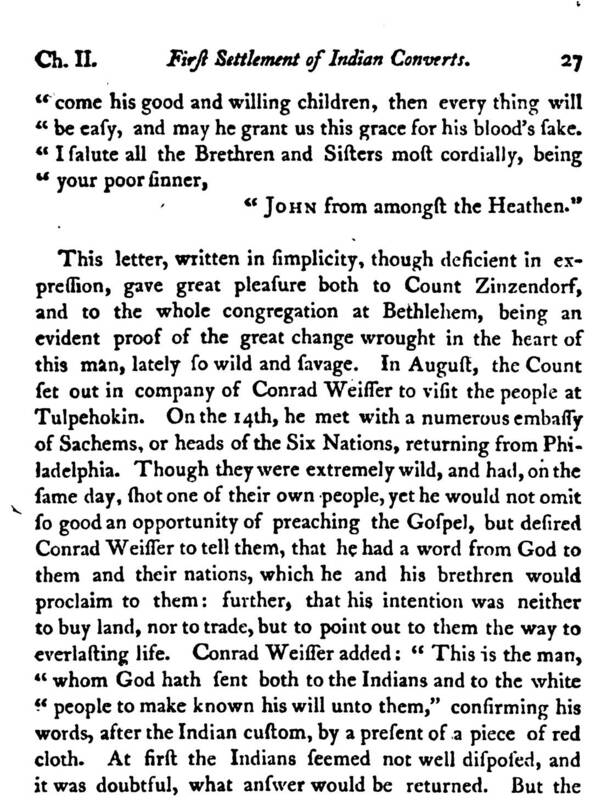 The Moravians wrote extensively about these two Mohicans and their helpful influence in converting other Mohican and Delaware. Shabash means “running water.” I was unable to translate Tschoop. One diary describes Tschoop as a man with broad shoulders, a barrel chest and huge arms, a physique “more like a bear than a man.” In time I learned that the missionary who first met Tschoop pronounced the letter B as though it were a P. In his German dialect Job sounded like Tschoop. 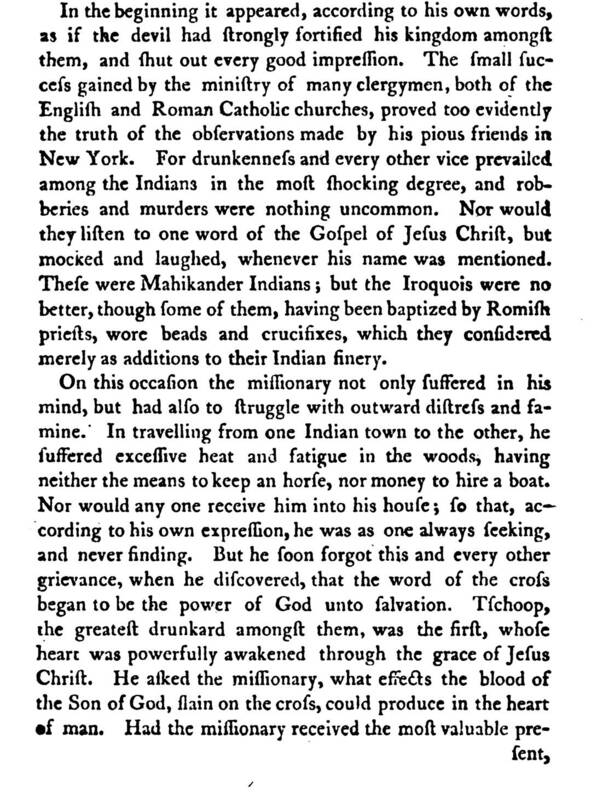 Other recording preachers thought Tschoop was an Indian name and referred to him as Tschoop in their diaries. At Bethlehem I was surprised to learn that the grave of Tschoop (Job) baptized as Johannes or John was visited in the century following 1820 by more than a million people. 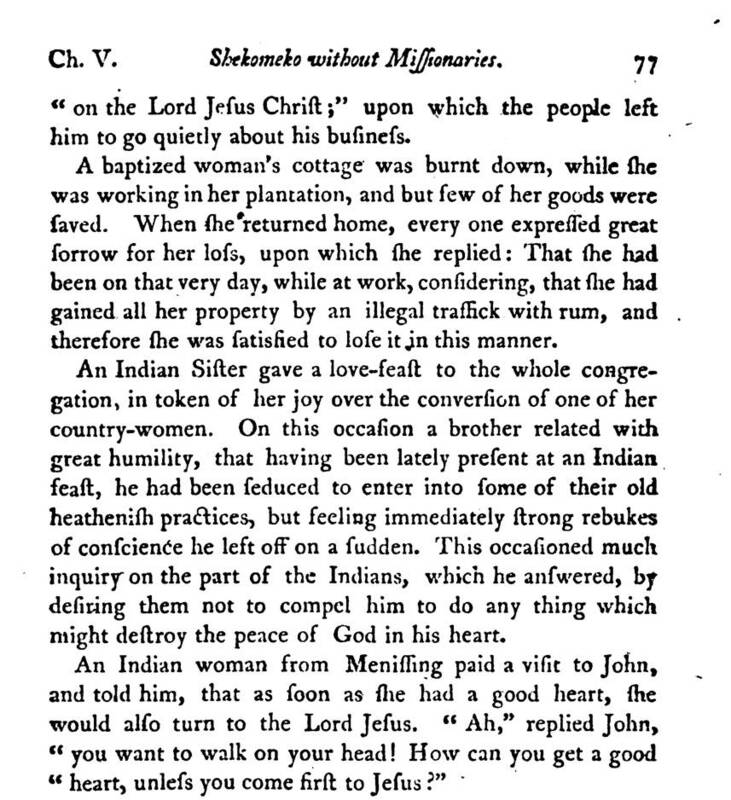 Job was one of three Moravian Indians whose lives were studied by James Fenimore Cooper. From what he read of them, Cooper fashioned the character of Uncas and Chingachgook in the Leatherstocking series. Posthumous fame and an initial stream of visitors came to Tschoop seventy-five years after his death when The Pioneers was published. 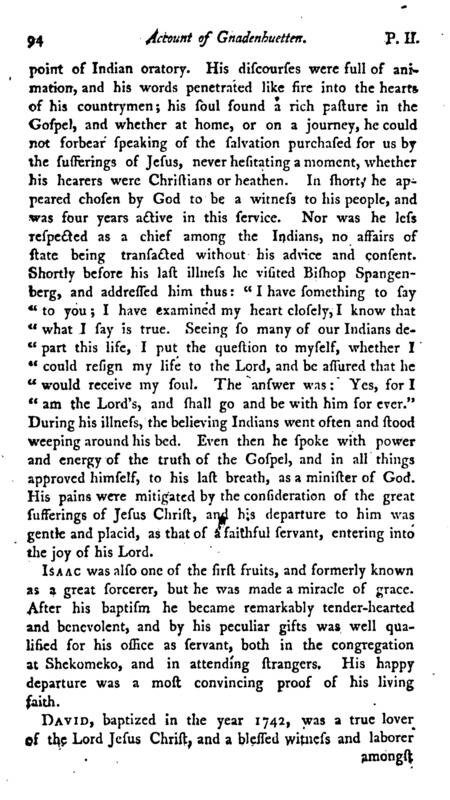 Even today people come to see the grave of “The Last of the Mohicans.” The headstone of Tschoop’s grave is in Gottes Aker at Bethlehem where he died in August 1746. Attempts made by all Mahicans in Shekomeko to preserve peace, with NY Governor, with Sharon Ct., with Rhinebeck residents.